We’re gonna need a bigger PR Board!! Jane “the pervert” as mentioned before last year she was crushed when she did not pass her firefighter physical by 6 seconds. After of a year of training here at Dogtown and her own she CRUSHED the physical by two minutes. Congrats once again to #Jane. Next up, Ana Martinez with two massive PR’s last month. 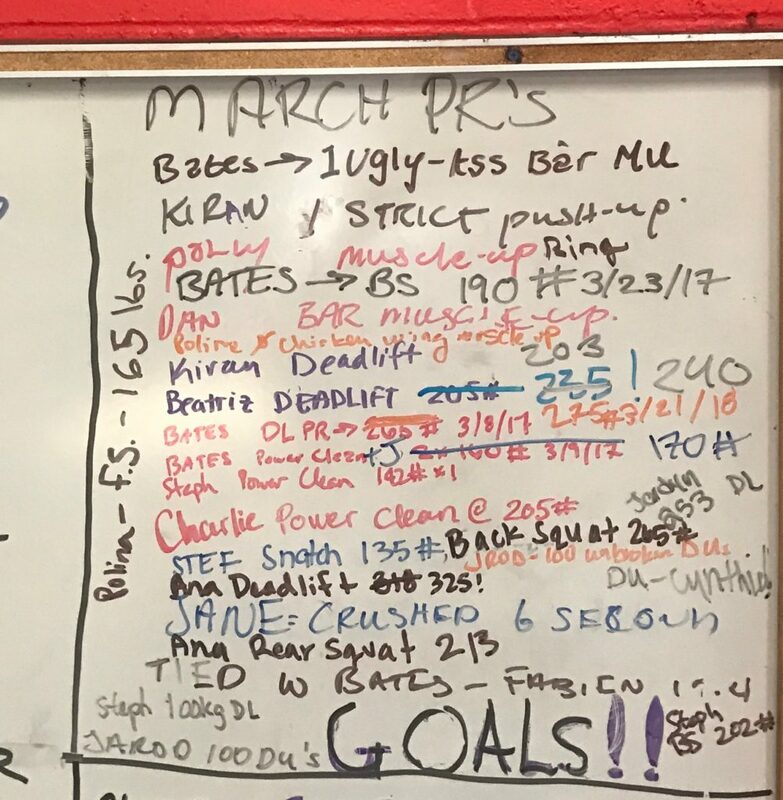 She achieved her 2017 goal of #deadlifting 325 pounds and followed through with a 213# Back Squat as well. Additionally, she really pushed herself during the Open. Jarod killed it with 100 double under straight. (Nice work man). Beatriz and Kiranjit, I am just gonna lump you two together because you guys are attached at the hip most times. Beatriz had a nice PR in her favorite move of all time, the deadlift 203#. Kiranjit also had a nice #deadlift PR of 203# as well. (told yah, they’re attached at the hip). She also had her first strict push-up (SHE HATES PUSH-UPS)!!!! Stefanie just went ahead and snatched 135 for shits and giggles (good work) I love you seeing you lift. Daniel K. bust out his first Bar Muscle-up and it didn’t have chicken wing (Nice work man) and a real #handstand push-up. Polly had her first ring muscle-up and front squatted 165# killing the game. Melissa Bates killed the game last month. Jordyn @jordynduggan likes ripping 253# off the ground, Beware #derby girls, she’s strong. We also have Cynthia V with her first double-unders. What can I say? I really appreciate everyone pushing themselves to the limit and getting past mental and psychical barriers. Your success in turn inspires others to push themselves as well.